The book’s title comes from Jonathan Swift’s essay Thoughts on Various Subjects, Moral and Diverting: When a true genius appears in the world, you may know him by this sign, that the dunces are all in confederacy against him. A Confederacy of Dunces’ protagonist, Ignatius Jacques Reilly, is described in Walker Percy’s foreword as a slob extraordinary, a mad Oliver Hardy, a fat Don Quixote, a perverse Thomas Aquinas rolled into one. Reilly hates modernity and pop culture, preferring medieval philosophy, especially The Consolation of Philosophy, a work by the sixth-century Roman philosopher Boethius. The novel focuses on Reilly’s relationships with two women: Myrna Minko, a Jewish college student in New York, and Irene Reilly, Ignatius’s alcoholic mother. Reilly’s adventures and observations of New Orleans paint a rich portrait of the diversity of the city, including its various dialects; today on Canal Street, a bronze statue of the character recreates the novel’s opening scene, as Reilly waits for his mother outside the D.H. Holmes department store. John Kennedy Toole was born in New Orleans, Louisiana in 1937. He entered Tulane University at 16 and earned a PhD in English literature from Columbia University; afterwards, he returned to New Orleans to teach. He was drafted into the army in 1961, and he began to write A Confederacy of Dunces while teaching English to Spanish-speaking recruits in Puerto Rico. After facing rejection from leading figures in the publishing industry, notably Simon & Schuster editor Robert Gottlieb, Toole shelved the novel. Suffering from depression, he died by suicide at the age of 31. When his mother found the manuscript, she worked tirelessly to get it published, and succeeded in 1980. 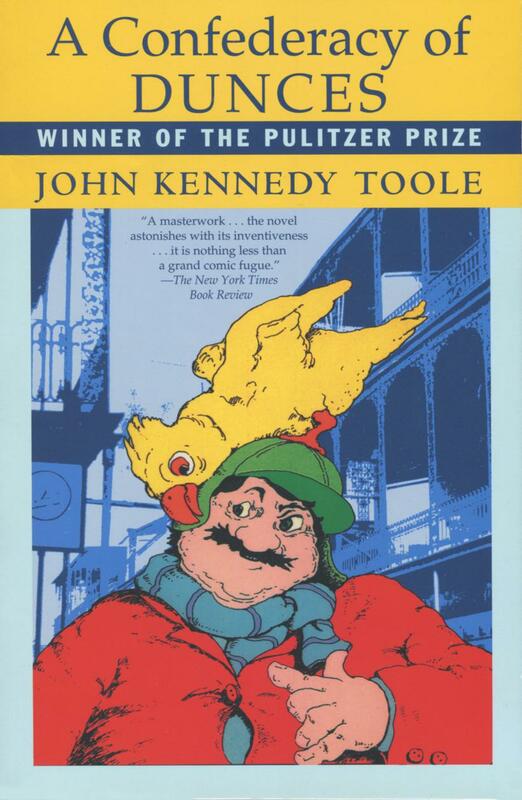 A Confederacy of Dunces was a bestseller, and in 1981, Toole was posthumously awarded the Pulitzer Prize for fiction.